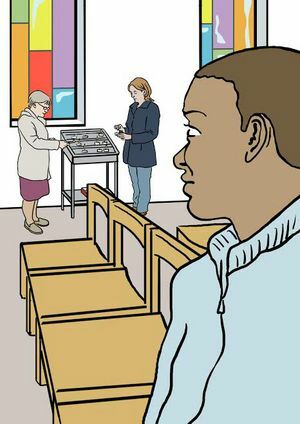 “Going to Church” is the latest in the series of wordless books produced by Books Beyond Words, helping people with learning disabilities to understand their world. The new book will enable access to places of worship, and the wider communities offered by churches. 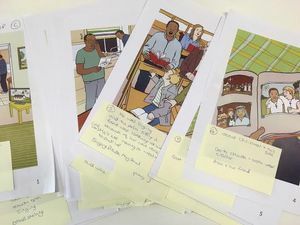 Beyond Words books are co-created by people who have learning disabilities, with about 100 people involved in assessing and trialling pictures, to ensure the story can be clearly understood. funding the development of an associated training programme, based on the new resource, sharing our methodology with partner organisations and helping church communities to welcome and support full participation of people with learning disabilities. “Going to Church”, has been co-authored by Professor Sheila the Baroness Hollins and Professor John Swinton, Aberdeen University’s Chair in Divinity and Religious Studies, working alongside other subject specialists, Kate Carpenter (self-advocate with LD), and illustrated by Lucy Bergonzi.and people who have learning disabilities (LD). The co-creative process of developing pictures for the book has involved adults with LD sharing their experiences within Christian church communities. We always involve at least 100 adults with LD in assessing the pictures’ capacity to tell a consistently understood story with which others will engage. Input has also come from priests and clergy, as well as lay members. Our project will help to remove the communication barriers which so often prevent adults with LD exploring the emotional and spiritual facets of their lives. We will therefore not only support individuals in exploring their own spiritual aspirations, but also provide resources and training to engage and equip Christian church communities to respond in a way which promotes inclusion, valuing the whole person and caring for their spiritual, social, mental and physical wellbeing, supporting churches in fulfilling their commission amongst this marginalised group. “Going to Church” will be used to bring adults with LD out of isolation, enabling them to explore their own faith. This is especially relevant for the many adults now living in residential care who grew up within a faith community, as it will provide opportunities to return to worship. To purchase books click here or call Books Beyond Words on 020 7492 2559.